We could all use some inspiration when it comes to healthy food ideas, right? I want to share some of my favorite meals and snacks from the past week to hopefully provide some of that inspiration. Below you’ll see nutritious, satisfying, and balanced combinations. Not only that, they’re all pretty quick and easy to make, which means that you can eat healthfully without too much effort. Read on to prevent one of those “I have nothing to wear” moments, but, you know, in the kitchen. OH, how I loved this. 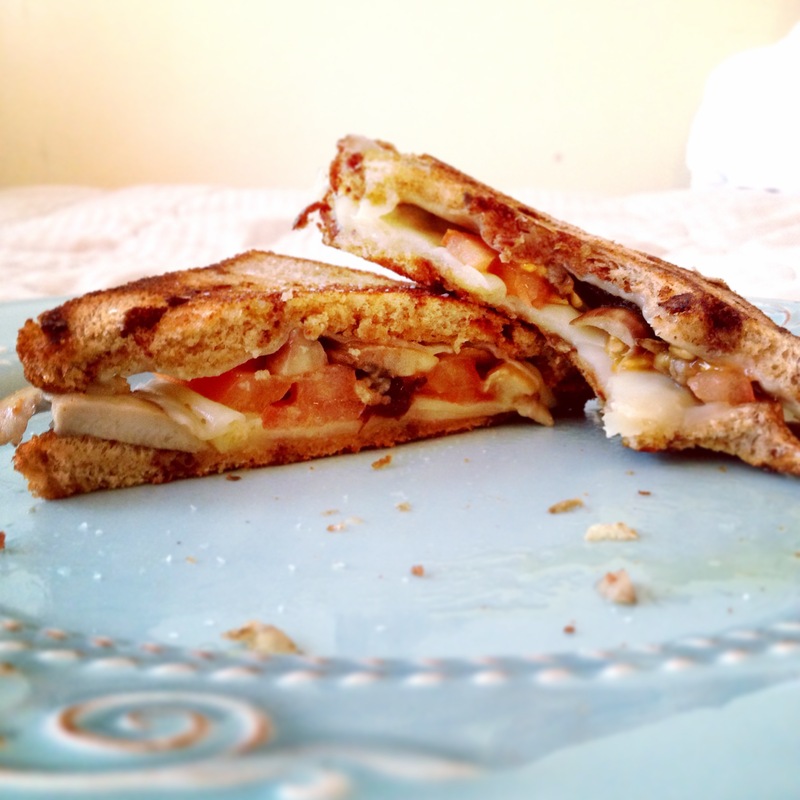 It’s a mushroom, tomato and Swiss grilled cheese sandwich with olive oil and salt. I don’t have an oven (truth), and I didn’t have a toaster oven when I made this the first time, so if you, too, happen to have a limited kitchen, this can be done on the stove. I sautéed the mushrooms first so they could cook down, and then I rubbed some olive oil on one side of a slice of bread and threw it on the pan. Once it was warm, I put the Swiss cheese, mushrooms, and tomato on and topped it all with the second slice of bread. Shortly after I flipped it, and I think covered the pan to warm the whole thing so the cheese would continue to melt. It was a bit haphazard, you see… REGARDLESS, once it was all done, I placed some fallen mushrooms back in between the bread, doused the plate in some olive oil and kosher salt, and enjoyed. I licked my fingers and the plate. To round this out and make it a filling lunch, add a fruit or side salad of mixed greens and some dressing. Do you hear angels singing right now? 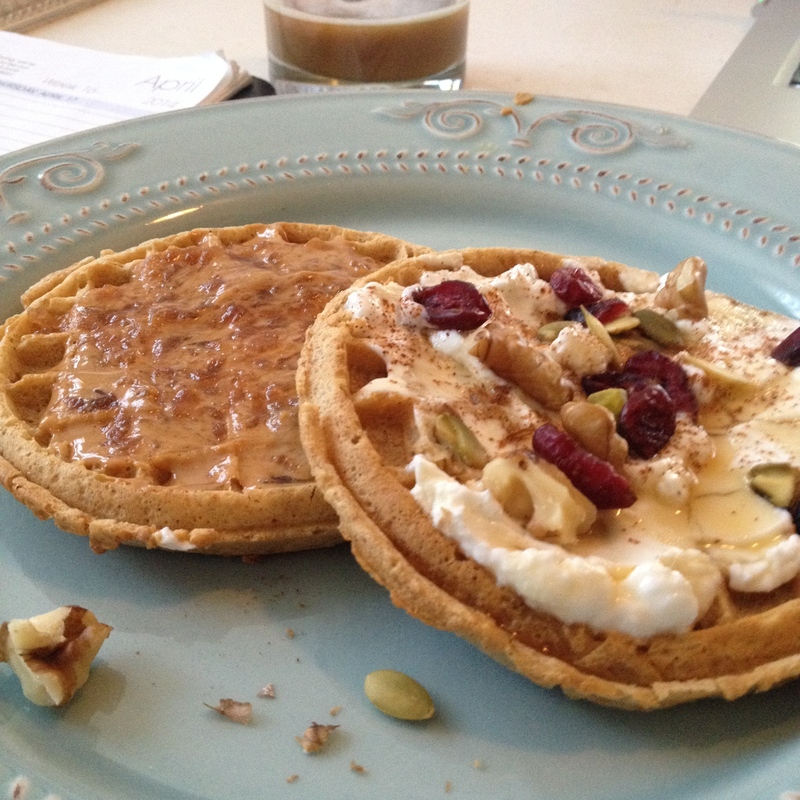 Kashi whole grain waffles have become a staple of mine for breakfast. They feel homey and indulgent and are a great source of whole grains. Pop them in the toaster oven (which I can now do instead of warming them on a pan…_and top as you wish. These have Greek yogurt, sautéed apples, raisins, almonds, cinnamon, and maple syrup. FUN FACT: maple syrup has less high-fructose corn syrup than agave nectar, which has lately been touted as a healthy alternative. Maple syrup is just as natural – it comes straight from the tree. So don’t feel bad about having your waffles and eat them, too. My mom and sister got me cinnamon pear jam from a shop in East Norwich, Long Island. I’ve grown to LOVE it with peanut butter. I put the combo on waffles, too. 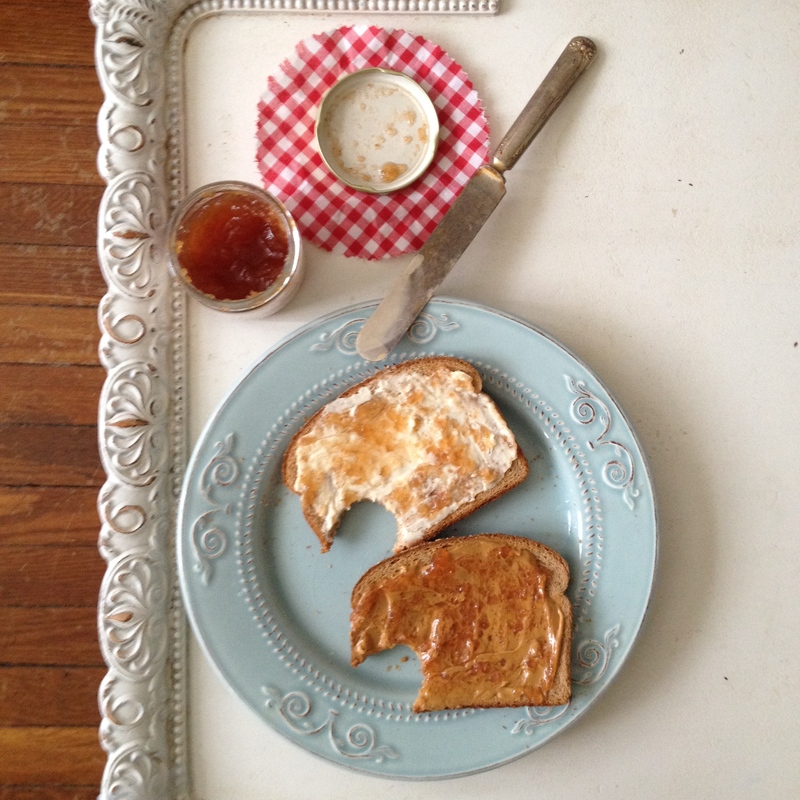 I was craving both sweet and savory that day so I did one half whole wheat toast with PB and jam, and one half with light Swiss spreadable cheese and jam. So simple yet divine. I made this for lunch the other day but realized it wasn’t filling enough. Greek yogurt with some fresh fruit and cinnamon on the side would be a nice addition to add more umph to this dish. I bet this looks like a big plate of pasta, right? Well, it’s actually “beefed up” with a ton of veggies! This was a delicious dinner from earlier last week. I’ve been learning a lot about heart-healthy diets and disease-prevention, and whole grains and vegetables pop up over and over. If you look at guidelines like MyPlate, you’ll see how much of each food group is good to include. A big handful of these whole wheat noodles and the rest of the plate as vegetables was nutritious and totally satisfying. Low-fat string cheese added protein to round out the dish. This is a go-to of mine. This was the result of boredom with my usual meals, limited protein in the house, and a gorgeous plate from Anthropologie (thanks, sis 😉 ). I tried to crisp my spinach by throwing on the pan with no water or oil, but it failed. Try to use kale for this, which doesn’t wilt nearly as easily as spinach and will add a nice crunch to this dish. Lightly dress your kale with olive oil and let it sit on a big pan until it browns. Meanwhile, dress grape tomatoes in olive oil and put them in the oven on broil. Before I had a toaster oven I did this all the time on pan and it worked equally well, if not better. I call them “blistered tomatoes” because of the way their skin wrinkles (you’ll see). This brings out the sweetness of the tomatoes and adds a really nice flavor to a dish. 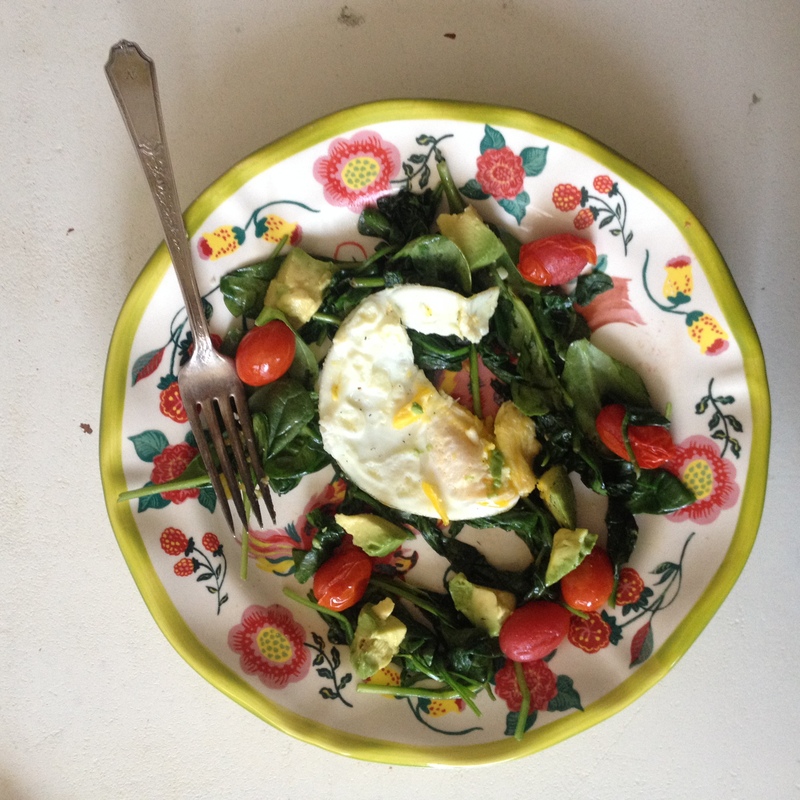 Make your egg to desired runniness while the kale and tomatoes finish, and serve with cut up avocado. It’s light but satisfying and has healthy fats and a ton of nutrients from the veggies and egg. I ate this for dessert last night. Okay, that’s not true. This would have been my dessert last night, but then my boyfriend came home and made cinnamon rolls, so it turns out this was a pre-dessert snack. The POINT, though, is that this is nice snack that can satisfy a sweet tooth at the same time. Don’t be fooled. I don’t eat this for dessert on the reg. Sometimes I eat fro yo. Sometimes I eat chocolate. Maybe an ice cream sandwich. But this can do the trick from time to time. I also decided to add dried cranberries for a healthy dose of fiber and antioxidants, both part of a heart-healthy diet. This isn’t a meal or snack, obviously. It was my latté this morning, and I’m proud of it. I’m trying way hard to save money and not spend $5 a day on coffee at Starbucks. So this morning I layered ice, almond milk, and a bit of sugar in a glass, and – this is the fun part – mixed in a couple drops of pure vanilla extract! 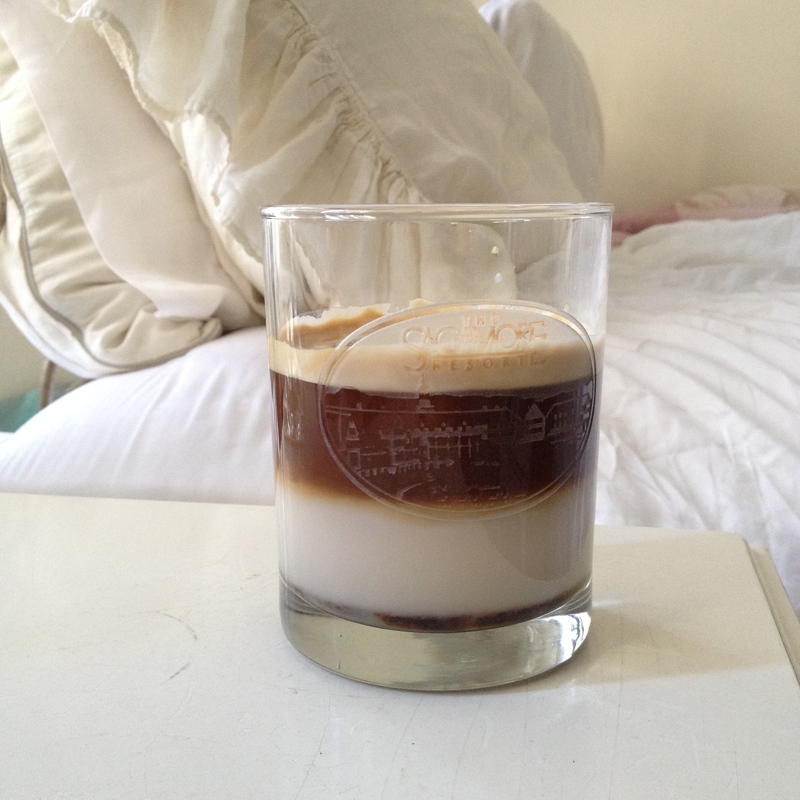 I made a serving of espresso into the glass and voila – had a fancy vanilla almond milk latté, homemade. Today’s breakfast. I was super into it. 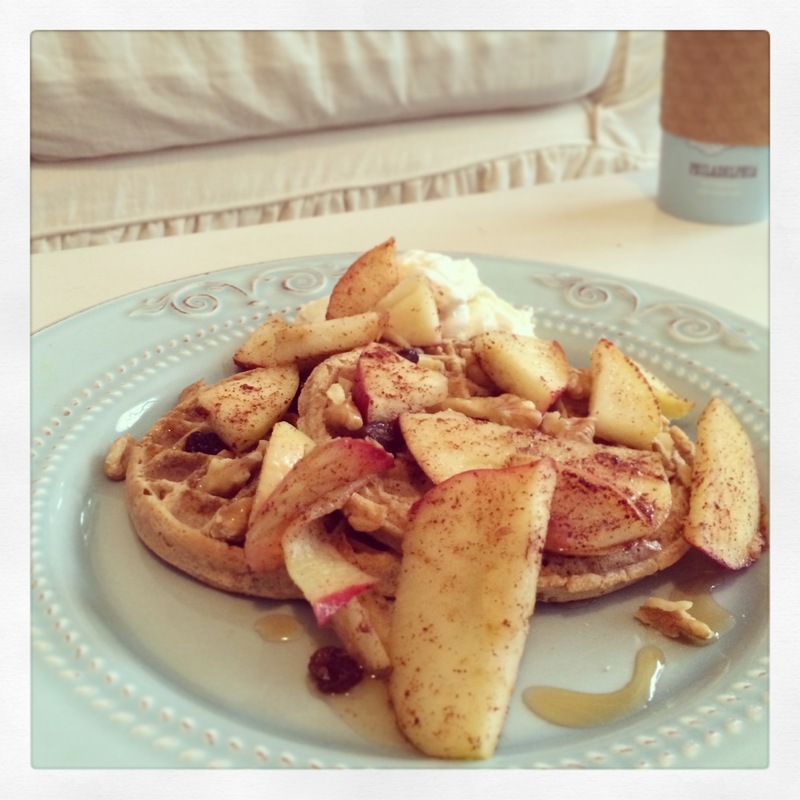 Kashi waffles, this time with peanut butter and aforementioned cinnamon pear jam. And another with Greek yogurt, trail mix, and maple syrup. 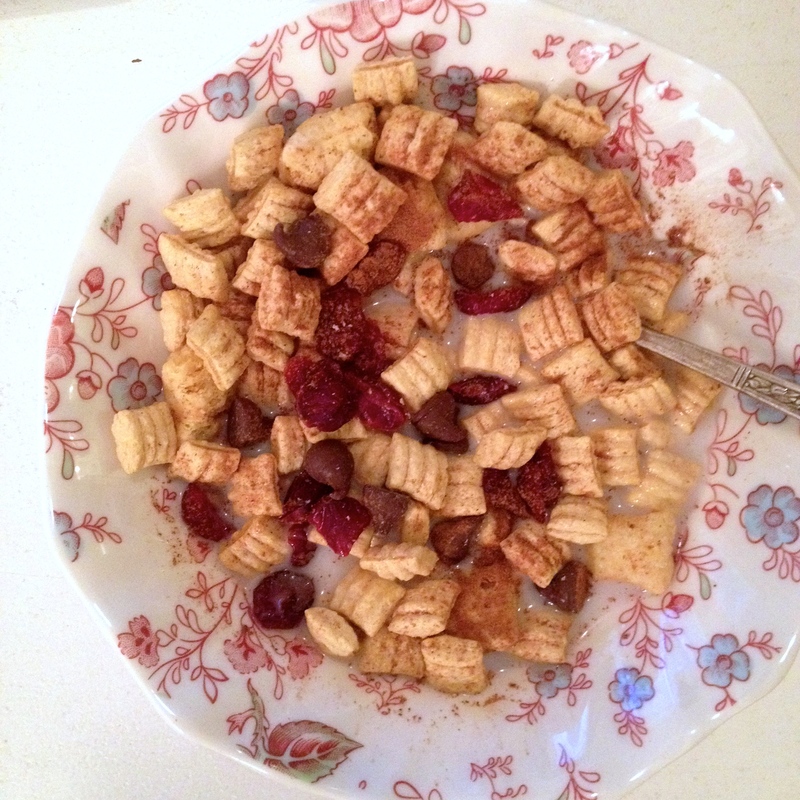 The trail mix added some protein, healthy fat, fiber, and antioxidants from the dried cranberries, and the yogurt and peanut butter provided protein. I could have added some fresh fruit to this to make it more filling, as I got hungry a bit earlier than normal, so if you make this, feel free to add to it. Snack time! I ate this in class one day. 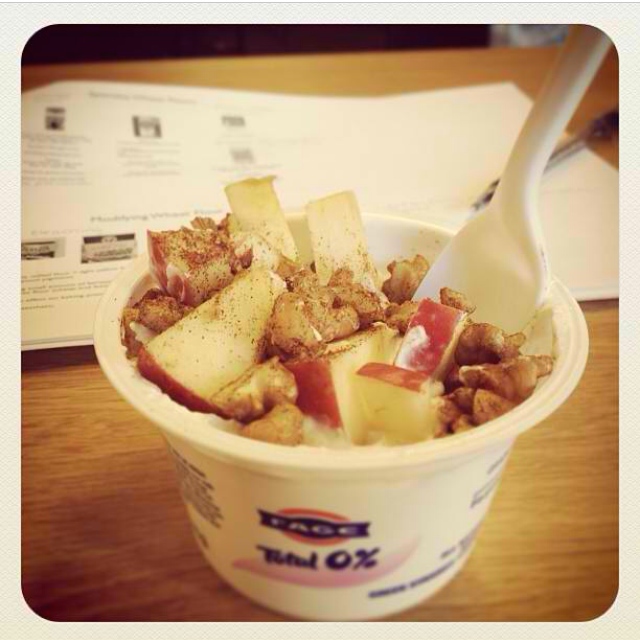 And somehow managed to snap a photo of it while in class… I cut up some apples before class and put them in a container and broke up walnuts and sprinkled them with cinnamon in a baggie. This is super easy, filling, and nutritious. Fun fact: acid can prevent your fruits from browning. I LIGHTLY rubbed some lemon on these apples after cutting. It adds a slight flavor, but if you don’t mind, it’s nice to keep them crunchier. 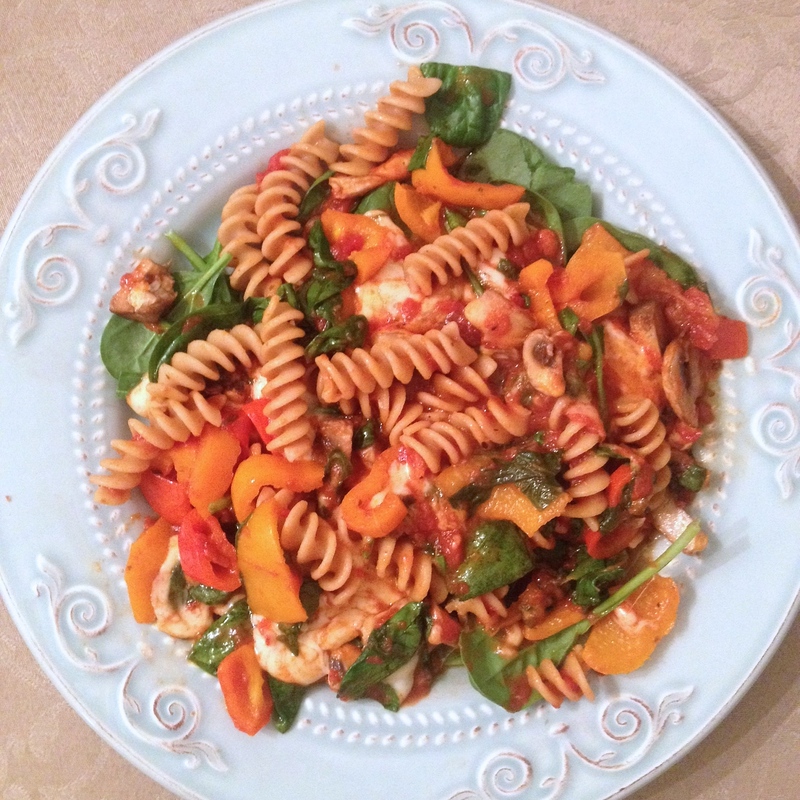 Get more meal inspiration here! This entry was tagged Anthropologie, breakfast, cereal, chocolate, coffee, dessert, diet, dietitian, dinner, espresso, fitness, food, food photography, food tips, Fresh Direct, healthy, healthy eating, heart-healthy, homemade, ideas, ingredients, Kashi, lunch, meal ideas, meals, meatless monday, nutrition, nutritionist, recipes, snacks, vegetarian, waffles. Bookmark the permalink.